Thanks for everyone who came out in the miserable weather on Saturday (12.08.18) to make our annual Christmas shopping trip a great success! 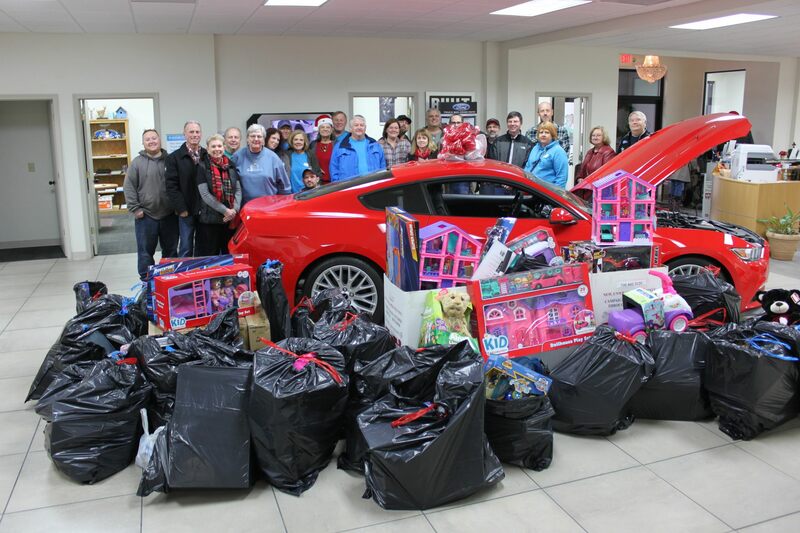 A special Thank You goes out to Fritz and the folks at Jacky Jones Ford for providing us with a great new Transit van, a fine photo op, and acting as our drop-off point for Toys for Tots and White Christmas goodies. Our new officers will be installed at our January 19th after-Christmas party. Over the next month our Secretary and President will work with their successors to assure a smooth transition. Until then: Merry Christmas, Happy New Year, Happy Holidays! P.S. Our Spring Show will be held at the Year One campus on 3/16/2019. Last June several members of the NE Georgia Mustang Club participated in the Hot Rod Power Tour. 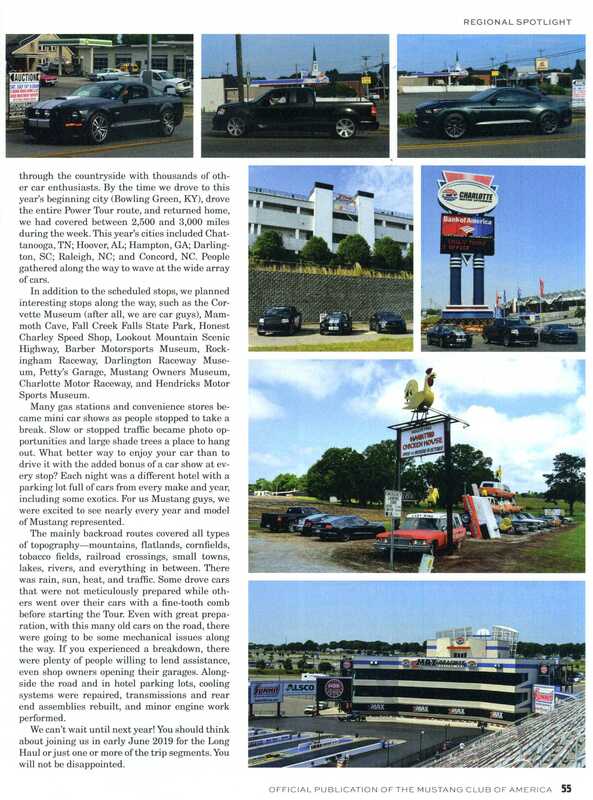 Afterwards we met and put together an article for submission to MCA’s Mustang Times magazine. The article was accepted and published in this month’s issue, enjoy the article. For those of you who have not been a part of the Hot Rod Power Tour, in June of 2019 the starting point will be at the zMAX Drag Strip in Concord, NC. Where the tour will go after that will not be announced until this January. 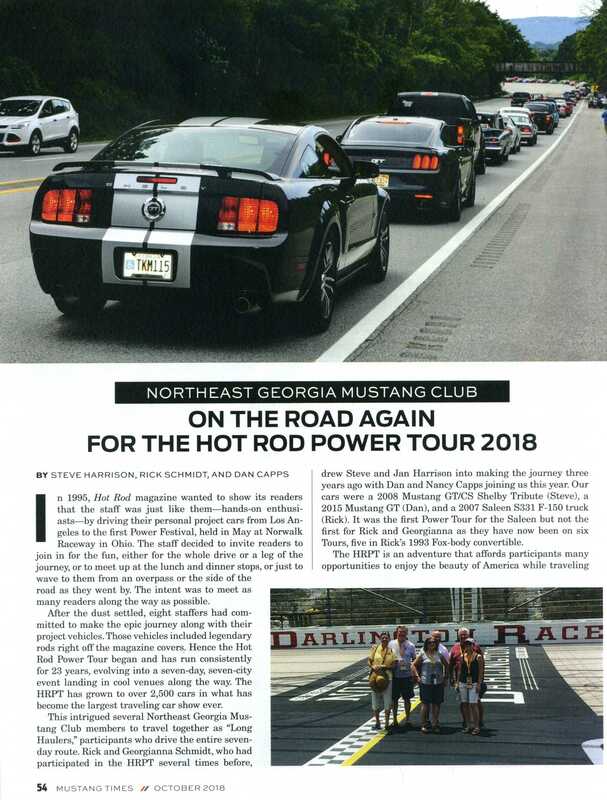 Several NE Georgia Mustang Club members will be taking the tour next year, think about joining us. I know you will have a great time. 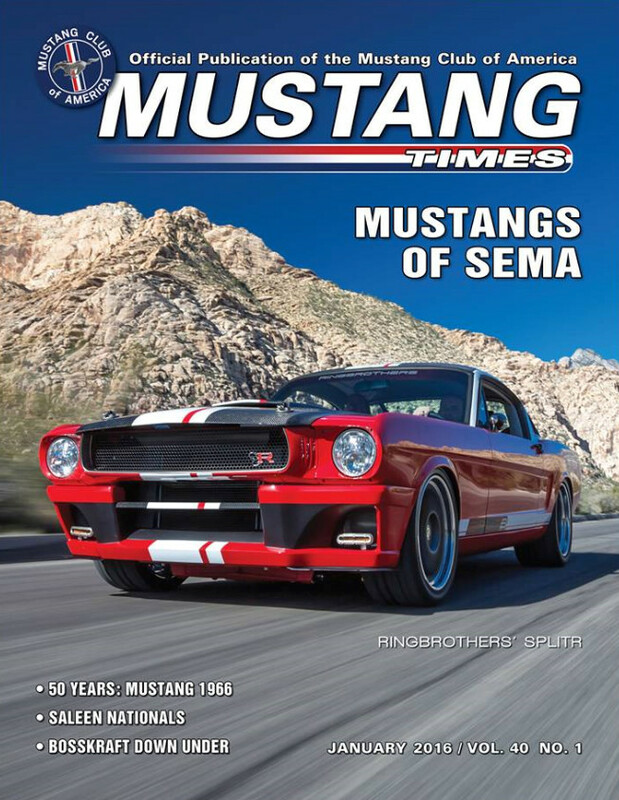 My fascination with Mustangs started when my brother bought a 1964 Ford Mustang. He was 12 years older than me and I looked up to him. I remember driving around the neighborhood with him and just being the talk of town in that Mustang. My brother would drive that car all over the place. He would even take it from northern Georgia to Daytona and Miami on a weekend. Once I got a little older and started driving he would let me drive the Mustang. I remember having such a blast driving that thing. Unfortunately, he sold it off for almost nothing when he was done with it. Fast forward to 1988. My family was complete as we had four children and it seemed that there was less time in the day than there was money. I started to get the itch for a Mustang of my own. I didn’t really have the time to work on a car and restore one, so buying a 1964 like my brother had was out of the question. 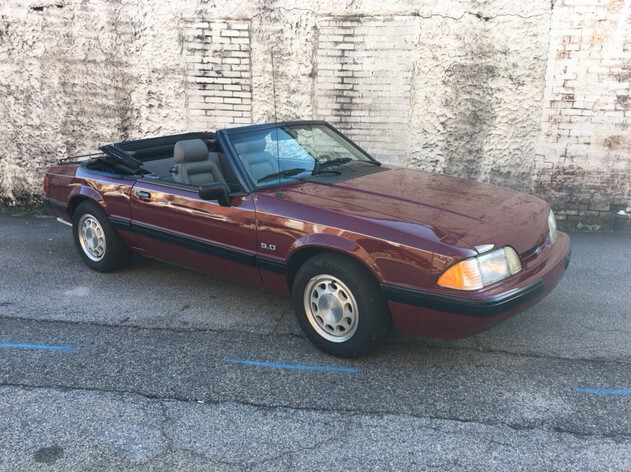 So, on my birthday in November I decided to buy a brand-new Fox Body Mustang. I ordered the early 1989 Mustang so that it matched the 1964 my brother had as close as possible. It had the V8, leather, convertible top, manual gear shift and was the closest color available to what my brother had on his. I pretty much drove my Mustang from 1989 to 1998. Following in my brother’s footsteps I allowed people in my family to drive the Mustang, so they could experience it as well. Unfortunately, when my daughter was a senior in high school (twenty years ago), she got in an accident with the Mustang. Luckily, she and everyone else involved were okay, but the Mustang was technically totaled. I had it towed to my garage where it sat for about a year. Not being much of a mechanical type person, I started taking an auto repair class at Lanier Tech in Gainesville, Georgia. During my classes I learned a few tricks of the trade, which I would take home and apply to the destroyed Mustang. Over the next few months, I replaced the convertible top, bezels, weatherstripping, moldings, door panels, carpet, leather upholstery, emblems and tons of trim parts among other things. Shortly into my work, I realized I was not meant to be an auto body mechanic, so I left that work up to a nearby auto body shop. With the rebuild, I tried to keep it as it was in 1989. I still have Norwest Automotive in Sugar Hill GA maintain the motor. They keep it in top running condition. Before I sent it to Norwest, the motor was leaking about anyplace that held fluid, but they managed to seal it all up for me and keep it running like a top. During my time with the Mustang, my wife has gifted me gift certificates to Mustangs Unlimited and bought me a few gift type items from you guys. The next thing I would like to get from you is a set of shocks, springs and struts. I love driving the car. I joined the Northeast Georgia Mustang Club, so I could be around like-minded people. It is rare that I take the car out and do not get thumbs up or someone telling me that they love the car or that they knew someone who used to have one just like it. It is great feeling knowing that I know such a great piece of Americana and that I played a part in restoring it after the accident. I am looking forward to the many miles ahead! 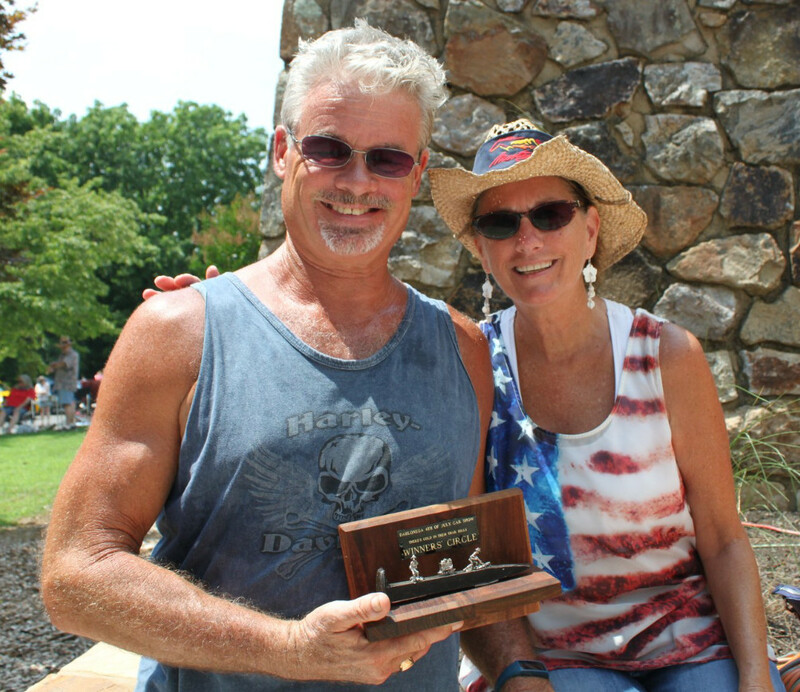 Dahlonega’s 10th Annual 4th of July Car Show had a great turnout of a wide variety of show cars. 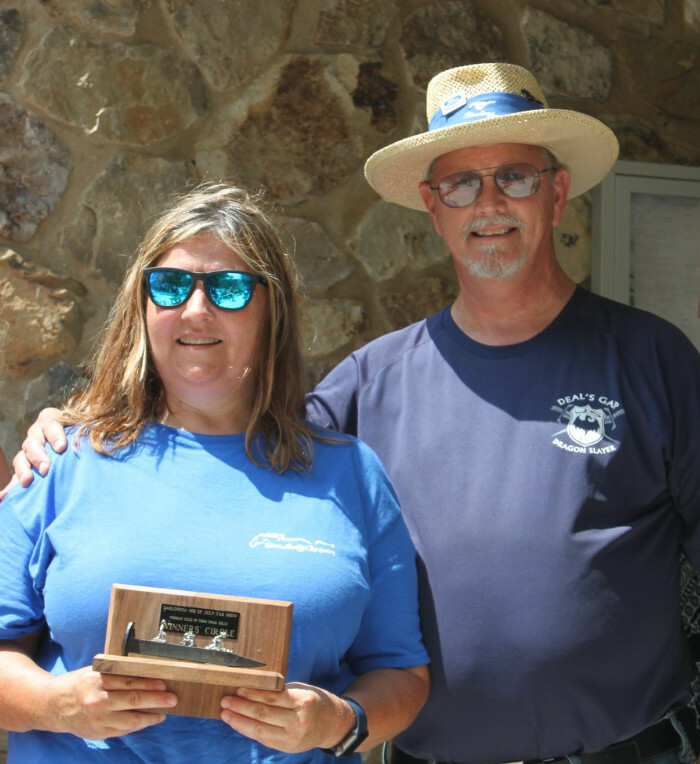 Your NE Georgia Mustang Club was represented in the winners circle by Suzanne & Frankie Newsom and Judy & Mark Juenemann. 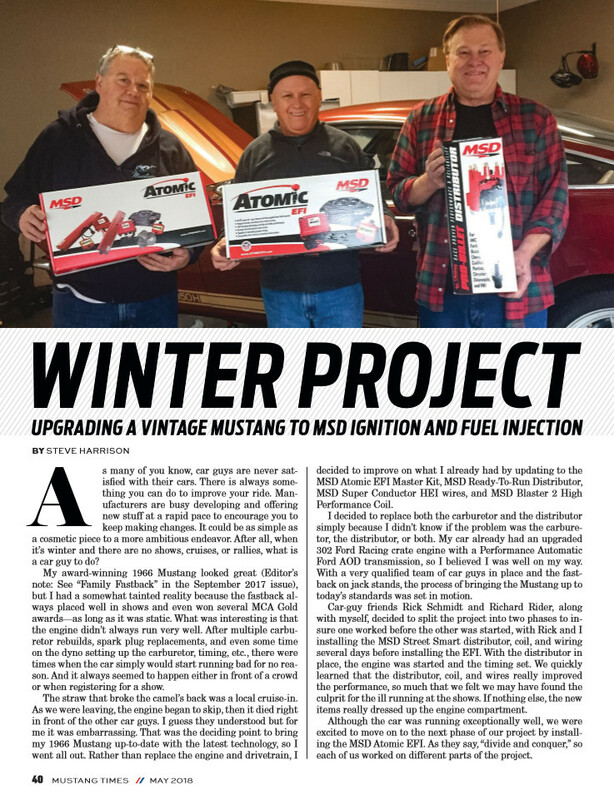 In the May issue of the Mustang Club of America’s Mustang Times is an article documenting the upgrading of Steve Harrison’s 1966 Fastback from a carburetor to Electronic Fuel Injection. 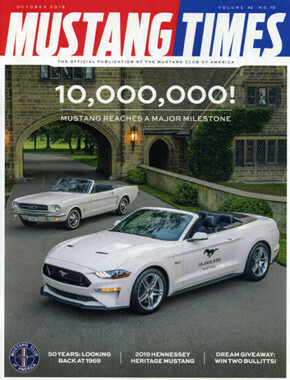 If you are considering a similar upgrade to your Mustang, the following is a good description of the effort required. On the 29th of August, the Northeast Georgia Mustang Club hosted the 42nd Annual Fall Regional Shelby/Mustang and Ford Meet in Maggie Valley, NC located on the southern edge of the Smokey Mountain National Park. On Friday NEGMC members caravanned to the Dillard House in Dillard, GA. Additional NEGMC members joined the caravan for a great Dillard House breakfast before continuing the cruise to Maggie Valley which included enjoying a drive across a section of the Blue Ridge Parkway. We spent the afternoon preparing for the show and registering cars for the following day. We knew we were going to have a great turnout for the show on Saturday as we had 74 cars preregistered and another 50’ish registered Friday. Saturday we were up early and were greeted by overcast skies but no rain all day. 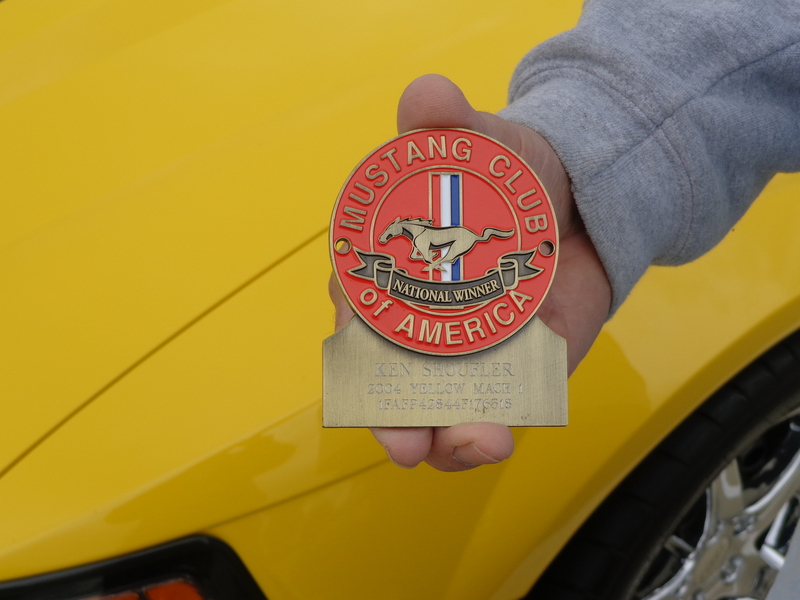 At 8:30AM we opened the gates and by noon when registration cut off, we had registered a record 224 Mustangs and other Ford products. 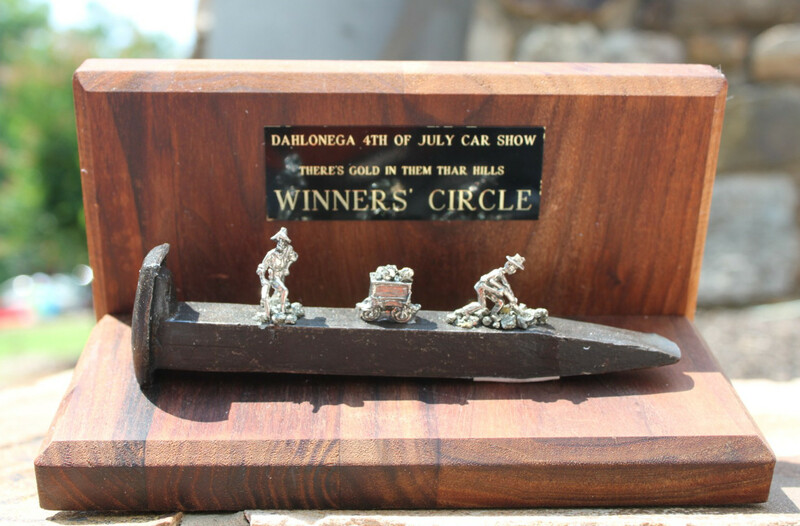 This was a popular vote show with the top three cars in each of 26 classes receiving an award of a pressed metal sign which featured the 3 Best of Show winners from the previous year. After cleaning their cars the participants roamed the show field enjoying the fellowship and cars of the other participants plus the food and various other vendors including Mustangs Unlimited and Jacky Jones Ford until the awards ceremony began at 4:30PM. 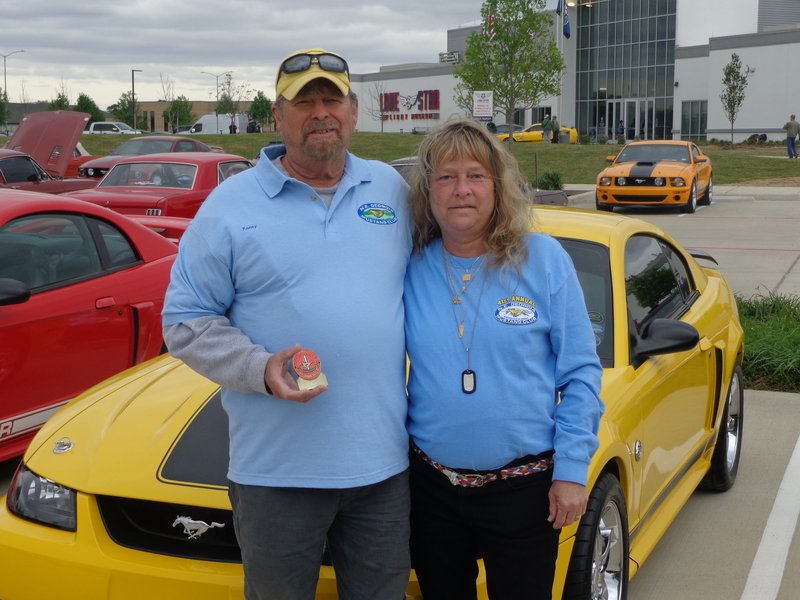 Congratulations to the Best of show Early Mustang, Best of Show Late Mustang, and the Jim Osborn Award (best of show non-Mustang) winners, their vehicles will be featured on the 2016 show awards and t-shirts and congrats to all the top 3 in class award winners. On Sunday several club members had a great time running a rally starting in Maggie Valley and ending with lunch in Highlands, NC, before heading home. If you’re in the area next Fall, come see us on October 1 at the Maggie Valley Festival Grounds, we’d enjoy meeting and hosting you in Maggie Valley’s beautiful surroundings. What a great car show today! We had 123 cars! 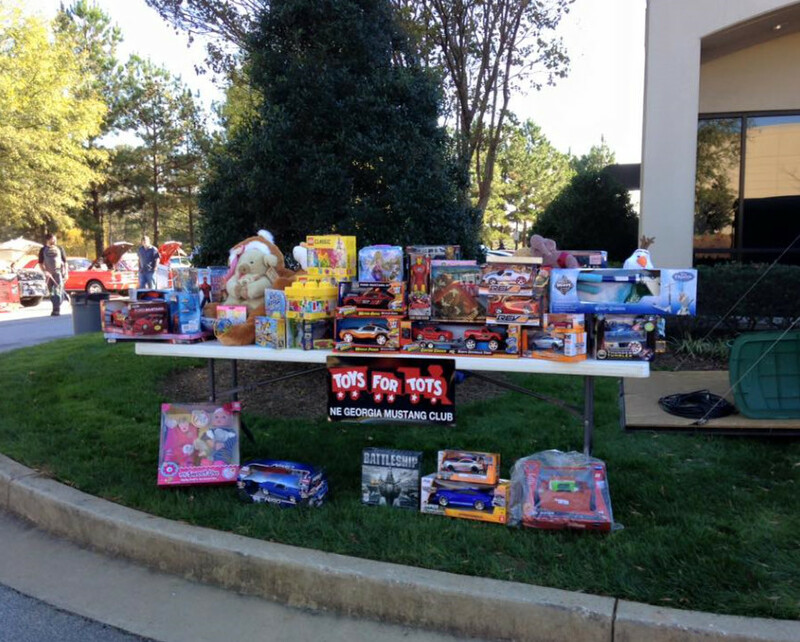 Thanks to all the Mustang and Ford owners and enthusiasts that came out and helped us raise money and toys for the kids! The Northeast Georgia Mustang Club really appreciates your support of this event. Because of the success of our shows this year, we will be able to donate several more thousands of $$$ to Toys for Tots this year, in addition to these toys collected today, and help many children have a merry Christmas who otherwise may not!